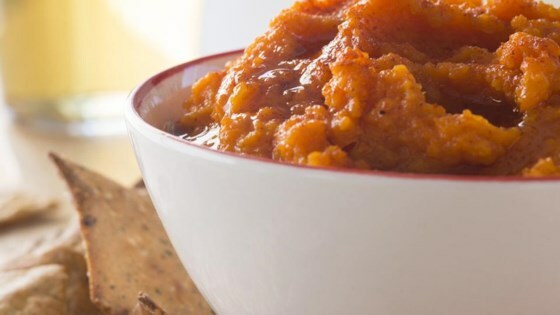 "Carrot dip may sound unusual, but this Mediterranean-style blend is a perfect balance of sweet and spicy, and a nice change of pace from hummus. It's delicious with pita bread or pita chips." Put carrots, garlic, ginger, and 1/4 teaspoon salt in a large saucepan. Add 2 cups water to cover. Bring to a boil, then reduce heat and simmer, covered, until carrots are tender, 10 to 12 minutes. Drain. Transfer carrot mixture to a food processor along with remaining 1/2 teaspoon salt, apricot preserves, lemon juice, sesame oil, coriander, and cayenne. Process until almost smooth. taste was nice and different but it turned out more like a soup so i could not take it to a work party. not enough time to buy more carrots and boil them up. I found this very interesting flavor wise and served it with celery sticks and pita bread wedges at a work potluck. I was received with mixed reviews. Love the perfect combination of texture and flavors of this dip! I added a bit more cayenne pepper to zip it up. Also excellent with an assortment of vegetables to dip with. Sweet and healthy. I will definitely make this again. Absolutely fantastic!! So much flavor, healthy, and easy, I will definitely be making this again!